Revel in a world of glamorous parties and sneaky celebrity hookups. "I love this game! I love all of the games in the Delicious series and especially love Emily and her sister Angela. It has a great story line, very cute visuals, and most importantly, is fun to play! I own all the Delicious games and I hope they make many more Delicious Emily and Angela games." Brought to you by the creators of Delicious, nothing is what it seems in Fabulous: Angela's Fashion Fever. Truly, the famous fashion queen, picks Angela as a finalist in the contest to take over her crown. Angela revels in a world of glamorous parties, fancy hotels and sneaky hookups with her celebrity crush. The stars seem to be aligned, but beneath the glittering surface, Truly hides a bitter secret. 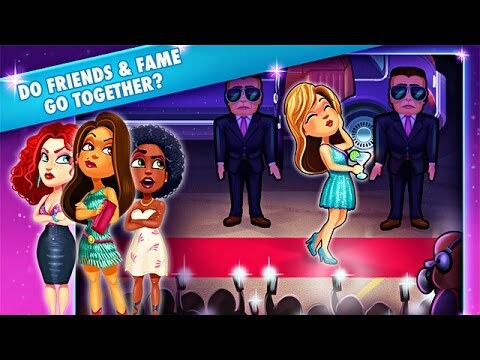 Become the biggest name in fashion, travel to exciting places and design beautiful clothes in Fabulous: Angela's Fashion Fever. I have played Emily's Delicious series for many years now so I had high hopes that Angela's would meet my expectations. I must say it has exceeded those hopes. Highly recommended! I loved it! I have not played this game all the way through, but so far I am enjoying it. If you enjoy Emily' Delicious games, you will love this. The game play is the same but the story line is very much different. I enjoy exploring the fashion dreams of Emily's sister Angela. I recommend this game highly. The previous version was very short and I was waiting for more. Well we got more! There are over 90 different levels!. There are new challenges along with some of the favor things we loved about the first one. Enjoyed it! This is a great game with lots of levels and good graphics. The game has a great story line that is easy to understand and carries on from the Delicious Emily games. I would recommend this game if you enjoy the Delicious series. Like all the Delicious Emily games, Fabulous Angela's Fashion Fever is great fun and really addictive to play. It's fun looking for the mouse on every level and facing lots of challenges throughout the game. I would recommend this game to anyone. Along the lines of Emily's Delicious series, Angela's Fashion Fever does not disappoint. This second game in the Fabulous series has a lot more levels and a very interesting storyline. Extremely enjoyable to play and highly recommended. This is a great game. It is a spin-off of sorts from the Delicious-Emily games, as Angela is her sister. I found this game to be very entertaining. It has a great story line and a lot of levels. This game download is definitely worth the price. I love all the Delicious: Emily games, and I own them all. So far, I have also very much enjoyed the Fabulous: Angela games. There are others as well... Maggie's Movies and Mary le Chef. These are all such great games, and I love where the Angela story has headed. Please, give me more, and soon! It's great. It reminds me a lot of the "Emily" games. It is a fun way to pass time and has a perfect balance of difficulty. I love these type of games. I just cant get enough of them. I feel like I could spend 24 hours a day 7 days a week playing these type of games, especially Delicious Emily games. It is similar to the the Delicious Emily games. I love this one as well and consider it a must have! This was an automatic purchase for me when I saw that it was released. Enjoy it! It´s the best game ever! It is fun to play and it has just enough difficulty to make you feel happiness when you complete a level. I love it. I liked the story line with all the characters. I'm looking forward to any future games that involve Angela! I immediately was hooked on this game since I also am a fan of the Delicious series. Each level gets more challenging, which I love. I hope more Fabulous Angela games are coming soon! I liked this. These types of games are good fun. I really enjoyed playing this game. I have most of Emily's games, and now it's Angela's turn! Fun and challenging. It is highly addictive to play. I love the Delicious Emily games and this is just as enjoyable. This game is great for those who love time management games. I love it. Love Emily's games but this one is just as good.